Try some recipes for Swedish glogg, white glogg, mulled wine with spices and tasty snacks . Glogg, or Gloegg, as we call it in Sweden, is the number one drink in Christmas time! Nothing can compete with the aroma and the taste of glogg in Advent. And it is heavenly to drink a cup of glogg after being outdoors in the cold and damp weather around Christmas time. The glogg is heated in a saucepan, and kept warm in a mulled wine warmer for the real feeling. 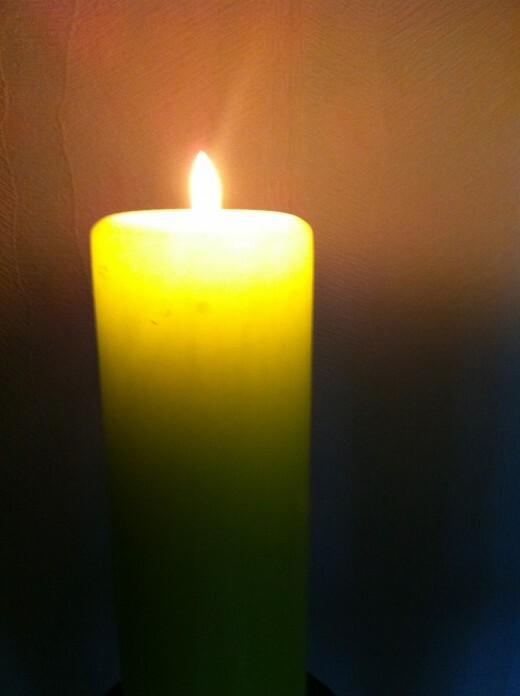 Other important details are happy and friendly people, candles and some other accessories like raisins and almonds. The special with Swedish mulled wine is that we add many spices, vodka or cognac and some sugar. 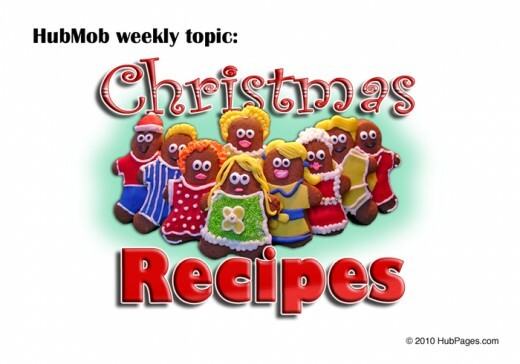 I will share some very tasty glogg recipe and glogg snacks for you to try! 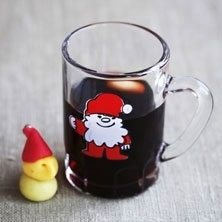 The term glogg comes from the Swedish word for heat (gloedga). The word “mulled wine” is first heard of in the 1600s in Sweden. In the southern parts of Europe the practice of drinking seasoned mulled wine had been usual for a long time. But long before that the mulled wine was usual in ancient Greece. The Romans sweetened their wine and flavoured it with spices and flowers. In the Middle Ages was spiced wine very popular in Europe. The spices were considered curative, but it could also hide the bad taste of the wine or improve a bad wine. The sanitation was poor and many believed that it was healthier to drink mulled wine than to drink water! And maybe it was! At least it was heated, and wine in moderation is said to reduce risk for e.g. heart disease. In the late 1800s, mulled wine became more widespread as a Swedish Christmas tradition. And now days we drink about 7 million liters of mulled wine or glogg each year! In all European countries there is a local version if mulled wine. The difference between the mulled wine is primarily the taste. 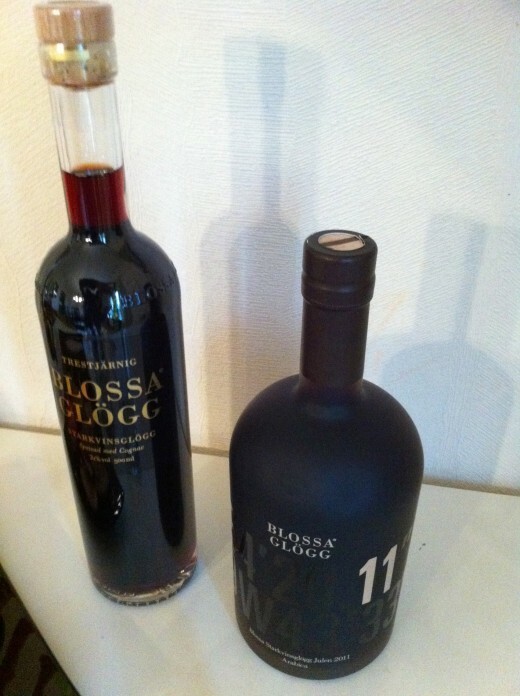 Here are some recipes for Swedish glogg! Some are usual, and some are a bit different. Even if we call it glogg, I will call them mulled wine in the recipes! Try them out and enjoy! Add a few raisins and blanched almonds in mugs or refractory glass and set a side. Heat the wine and spices gently in a pot, stir the sugar until it dissolves, then add vodka. Simmer until the mulled wine almost boiling, then turn into the prepared cups or glasses. You can also serve non-alcoholic gloegg! Use the recipes obove but instead of the red wine; use a little more than 2 cups water (5dl), ½ litres blackcurrent juice, a little more than 3/4 cup concentrated apple juice (2 dl). Boil the spices in water for 5-10 minutes. Then add the juice and apple juice! Here is a variant with white wine and saffron that is delicious! Time for preparing: 1 hour 15 minutes. Let everything simmer up gently, don´t let it boil, then let the mulled wine stand for an hour, and add the last bit of powder sugar. 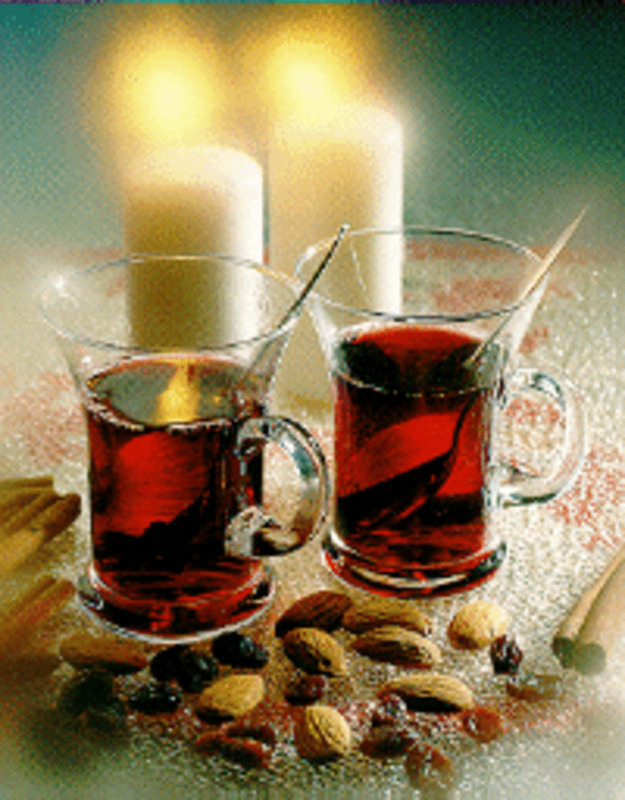 It is beautiful to let the spices remain, but the mulled wine can also be screened. Enjoy this delightful portion of magic in Christmas cosiness with your family and friends! Mix and heat the wine, sugar, brown sugar, cinnamon sticks, cardamom and cloves in a pot. The mixture should not boil. Pull the pan aside and let it soak for 3- 4 hours. Strain the spices. Add the vodka and heat the mulled wine. Serve with raisins and almonds. Heat the wine, bluberry juice, sugar and spices. Withdraw from the heat and add the blueberries. 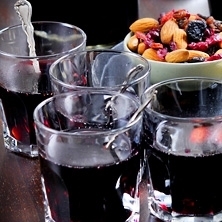 Mix some dried blueberry with almonds and serve with blueberry glogg! Tasty snacks to the Gloegg - Mulled Wine! Chop the chocolate coarsely and place it in a bowl. Let cream, mulled wine and glucose boil and then pour it over the chocolate. Don´t do it the other way, or the chocolate will be too hot! Stir until the chocolate melts. 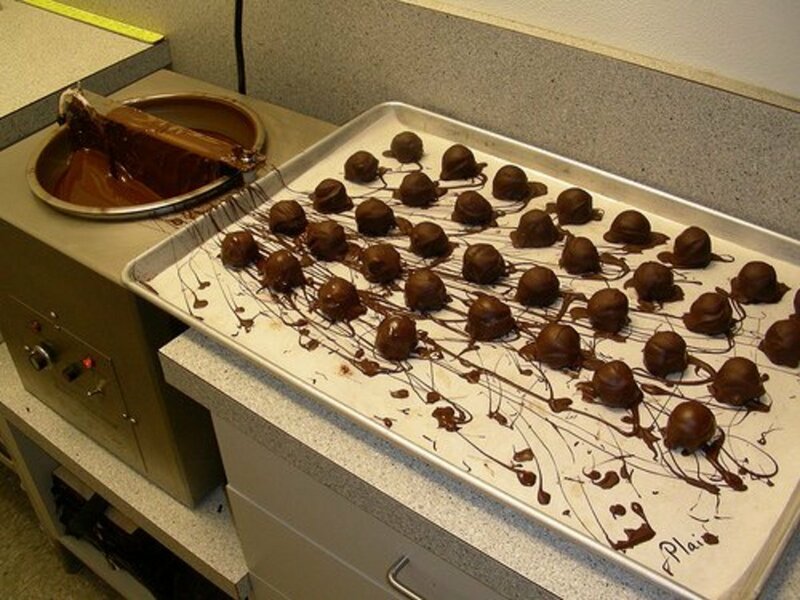 Cover with plastic film and set the mixture in the refrigerator a few hours to solidify. Roll balls of the mass and cover them with cocoa. Store the truffles in a cool place. 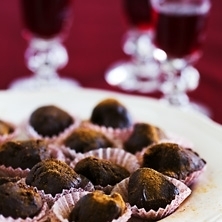 Tip: Alternative you can make mulled wine truffles with white chocolate and white mulled wine and roll in toasted coconut or grated white chocolate. Glogg - and gingerbread balls! These balls contain Swedish gingerbread or Swedish thins! 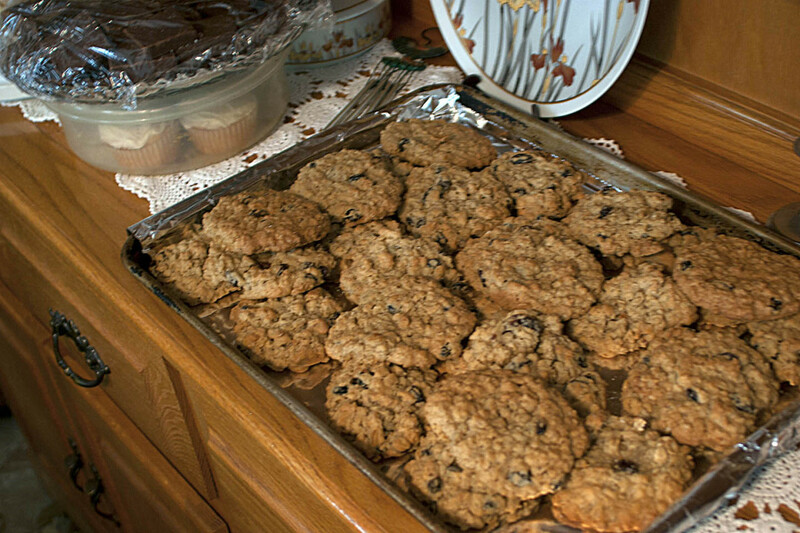 You can read how to bake them here! 10 pieces of finely crushed ginger. Hi Sherry Hewins! 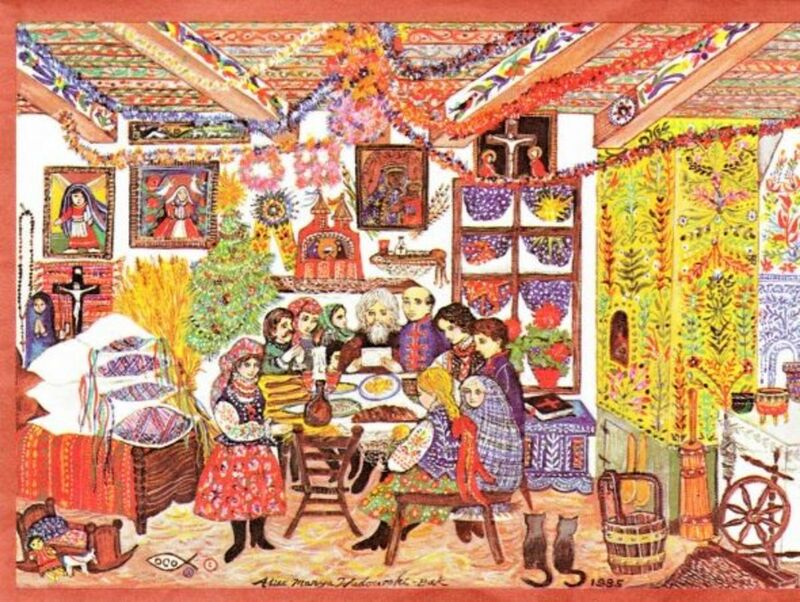 Yes, there is no proper Advent or Christmas without gloegg! Thanks for reading and for the comment, I appreciate it and I hope you try some gloegg! Looks like a good way to get into the holiday spirit. Voted up and shared. Alicia, I am so glad you liked this and I hope you will enjoy trying it. We need something warm and cosy during this cold and dark season! Best wishes to you, Alicia, and thanks for your support! I love these recipes, Tina! I've bookmarked your hub so that I can use the recipes in the near future. Your mulled wines and the treats will be wonderful to drink and eat at Christmas! David 999, it is so nice to meet you here, och se en kommentar på svenska! Thanks! acaetnna~ Yes, it´s good that you can get some different flavours and strenghts, since we all have different taste! I personally prefere the white glogg. I do hope you find your favorite! Thanks for coming by, I appreciate your visit here! Gosh lots of super tantalising recipes to try and I definitely shall be trying them. They sound wonderful and I like the way one can adjust the alcohol content. I shall bookmark this page for future reference. Thank you Thougtforce. febriedethan, I can really recommend that you do! And one can adjust some of the spices and of course the alcohol amount to ones taste! I am glad you liked it, and Thanks to you! Hello robie2, Nice to meet another glogg lover! Glogg is a tradition that is wide spread around the world, and we know why! Thanks for taking the time reading and your comment! Love to try these, thank you for sharing! Hello 6hotfingers3, I agree, just the thought of the aromas from those spices put you in a Christmas spirit! There wouldn´t be a Christmas without them! Thanks for your kind comment and your appreciation! Great! Great! Hub. There is nothing that compares with the aromas of the Christmas holidays. I can imagine how the mulled wine and snacks fill the air.heir aroma would instantly put me in the holiday spirit. Thanks for sharing this beautiful hub. Hello, prasetio! One can use juice instead of wine if it is difficult to buy wine! We always do gloegg with juice as well to those who don´t drink alcohol! I will add a non alcoholic recipe! Thanks for the tips and your comment, It is appreciated! Hi Katiem! I am so glad you liked it, and I wish you a nice time and great holiday season! Thanks for stopping by! I never taste wine before. And I thought this must be delicious using red wine. Nice recipe from you. Difficult from me to find a wine in my city. Thanks for share with us. I love wine and will def be giving your mulled wine a go this holiday season. Thanks! carrie, It wont be a Christmas without it, and it is good that there now are different recipes and tastes! Thanks for reading and commenting! Hello, Princessa! Gloog does help to keep the chill off! I am glad you liked it and I hope the trying is to your taste! Thanks for stopping by! These are great for those cold winter nights near the fireplace thougtforce. Thanks for sharing. With those warming drinks I can assure you I won't be scared about being cold! I like having a mulled wine, adding vodka goes for a strong variation that I am going to be trying this winter.